Here at The Holloweyed, we really love coffee. The smell, the craft, the process, the feeling of a fresh cup, it’s quite the serious love affair. Hand-in-hand with upstart music imprints and bands we seek to showcase there are some similarly wonderful and driven folks in the burgeoning regional coffee scene. Roasters like Boxcar (Boulder, CO) and Sightglass (SF, CA) are current favorites for what goes in the cup and recently, after a friend tipped me off via Twitter, we’re now all excited about a manufacturer of USA-made products for making the wonderful, wonderful brown stuff. There’s Aeropress and Chemex, but it’s not everyday a new dripper-focused product comes out to run alongside the Japanese made gear from a maker like Hario. The folks at the small, Portland-based Able Brewing, are rather stylishly seeming to be attempting just that. 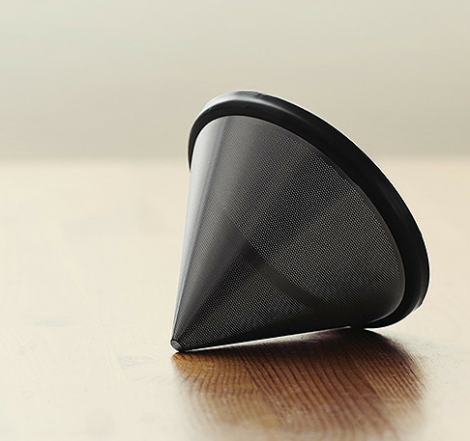 After a rather inventive splash with its reusable, stainless cone filter, dubbed the KONE (cut in such a way to allow a steady flow while minimizing sediment and already used at spots like Intelligentsia and Café Grumpy), Able has recently unveiled their new, fully-featured KONE filter and Brewing System and from the looks of their Kickstarter page aimed at funding the product, they’ve made yet another splash; with still 31 days to go in the funding, donations to the product are currently at $45,915- their goal was $5,000. 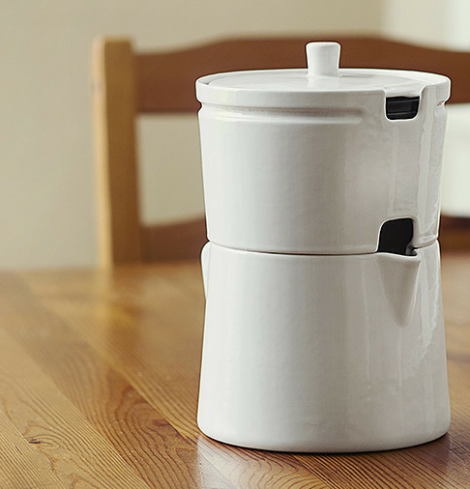 Up on Kickstarter are their KONE Filter ($45) handmade mugs ($25/ea.) and the combination of both the filter and the new ceramic brewing system ($125-$150 w/ mugs) which drips the coffee through the KONE, into a removable and elegant base/pot. Both the ceramic system and filter system are made in Portland. From the site: The brewer beautifully houses the KONE and after the coffee is done dripping, the filter support can be removed and replaced by an elegant lid. Up to 32 ounces of coffee can be served directly from the kettle. While designing the brewer, we also realized that with the KONE resting inside the kettle you could steep a full pot of tea. Head over to the project’s Kickstarter page to support and get rewarded with a mug, filter or the entire brewing system. You can also purchase of slew of brewing equipment from Able’s recently-launched online store. See a video of the system in action below.